Those of us who have played board games as children and later introduced such games to children at a young age wind up having a lot of fun as we match animals and their young, front and backs of animals and people, etc. When we have no board games available, we sometimes arrange playing cards face down on the table (or – a great favourite is on the berth when we are travelling by train) and we try to make pairs of sixes and eights and so on. Memory skills are built into the process as we try to recall where in the line-up we had last seen a particular card. Iris Games has come out with two interesting educational games which can be used to build up these memory skills and a lot more at various levels as a child grows older. The games can be played alone or in a group of up to four players so they are ideal for rainy afternoons – or extra sunny ones – when children cannot play outdoors. Fun with sides has four picture boards and 32 picture cards of people working in different professions. As the cards are picked up by the players (up to four can play at one time), they try to complete the picture board with the appropriate front, back, or side view of the professional. 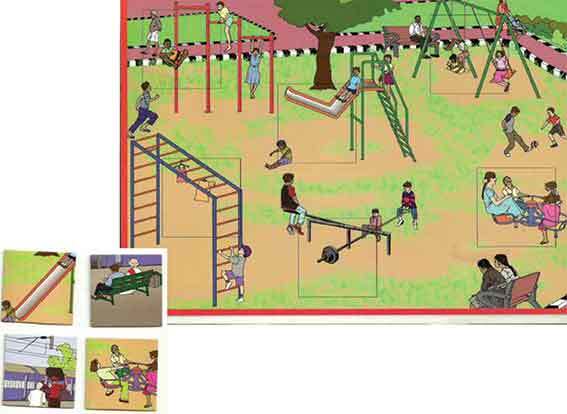 At its basic level, this is a game of visual perception – recognizing the professional and filling the blanks in the picture board – and the specified age of 3+ is appropriate. This can be adapted into a memory game, again played by up to four players, by placing the cards face down on the table and trying to find the ones that fill up individual picture boards. Thereafter, when the child is a little older, with the help of an adult, questions can be asked about each personal profile: who she/he is, what work is done, what is used to do this work, how the work is learnt, etc. The 204 word cards that are a part of the game pack can be used to help the child recognize letters initially and later, once the child starts reading independently, to go on to the next level of developing reading, comprehension and classification skills by filling in the vocabulary board that is provided. All levels of the game are fun to work through but there is one major handicap: the manufacturers have supplied only one vocabulary board. If there had been four vocabulary boards, playing with friends and each one getting to build up a profile of the professional they choose would be easier. Right now, it seems that one would have to improvise with a sheet of rough paper to do so! Fix Me Right can also be played at several levels. The first level involves fixing what is wrong with the four picture boards: a railway station, a library, a park, and a village. In each scene there are six squares where there are mistakes – for example, a woman dragging her clothes at the station, someone using a loudspeaker in the library, etc. The 24 picture cards that are provided can be shuffled and dealt out or picked by the players until each one corrects all the errors on their picture board. The second step is a discussion about these changes: What is the place? How does it help us? What do people do at such a place? What was absurd about each picture? Why was it wrong? How can you make it right? Thereafter, when players are familiar with words and can read, this part of the game can be played with the vocabulary boards and the 92 sentence cards, enabling them to pick sentence cards and fill up the vocabulary boards. However, here too, the manufacturer has provided only one vocabulary board of each type: What place is this? and What is wrong with the place and why? Both games are interesting and appealing and could make for an absorbing hour or two of fun and learning. The one inadequacy – not enough vocabulary boards – should be dealt with in order to get children to play the games along with their friends to make the experience an altogether – and all together – more enjoyable one!